Click HERE to see photos from the 2018 YDP Summer Experience! 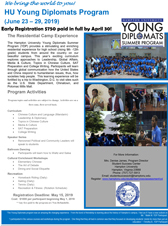 Hampton University's Young Diplomats Summer Program provides a stimulating and enriching residential experience for high school (rising 9th -12th grade) students from around the country on the beautiful campus of Hampton University. We will study Chinese Language and Culture, Leadership Development, Chinese Diplomacy, Economic Development and Global Affairs. Participants will learn through global communication how the United States and China respond to humanitarian issues, thus, how societies help people. This experience will be enriched by a trip to Washington, D.C. to visit sites such as the Freer Sackler Gallery of the Smithsonian Museum and the U.S. China Foreign Policy Foundation. We have lined-up a group of renowned political and community leaders to inspire the diplomats to make a difference in their communities. The diplomats will learn Robert's Rules of Order, and the art of debate. In addition, students will enjoy dining and social etiquette to effect change in both formal and informal settings. To enhance this experience, the diplomats will receive instruction in the waltz and salsa with an opportunity to display their creative movements at the closing luncheon. Students will also have an opportunity to choose their preference of recreational activities such as, horseback riding, sailing, or, fitness, and tennis For any questions or concerns, please contact the Student Success Center at 757-727-5913. Step 1: Please complete the Online Registration Form or you may send the printable version of the Registration Form (PDF) to mailing address: Hampton University, Student Success Center, Hampton VA 23668. Step 2: To pay the $750 early registration fee (before May 1st or $1,000 after) please continue to the next page of the online registration form and key in that amount into the "amount to pay" portion of the online payment form. Please include the additional cost of any extra polo shirts or larger sizes. You may also call the Cashier's Office at 757-727-5663 and pay the registration fee using your credit/debit card. Any fees paid to the program will not be refunded. The $750 early registration fee must be paid in full by April 30th if not the fee will change to $1,000 from May 1st to May 15th. Step 3: Please refer to the immunization requirements before you complete and submit the Special Program – Medical Clearance Form (PDF) form to the Health Center via U.S. postage to mailing address: Hampton University Health Center, 132 William R. Harvey Way, Hampton, VA 23668. Step 4: Complete and submit the Medical Consent Form (PDF) to the Student Success Center via U.S. postage to mailing address: Hampton University, Student Success Center, Hampton VA 23668, or you may scan and email it to studentsuccessctr@hamptonu.edu.